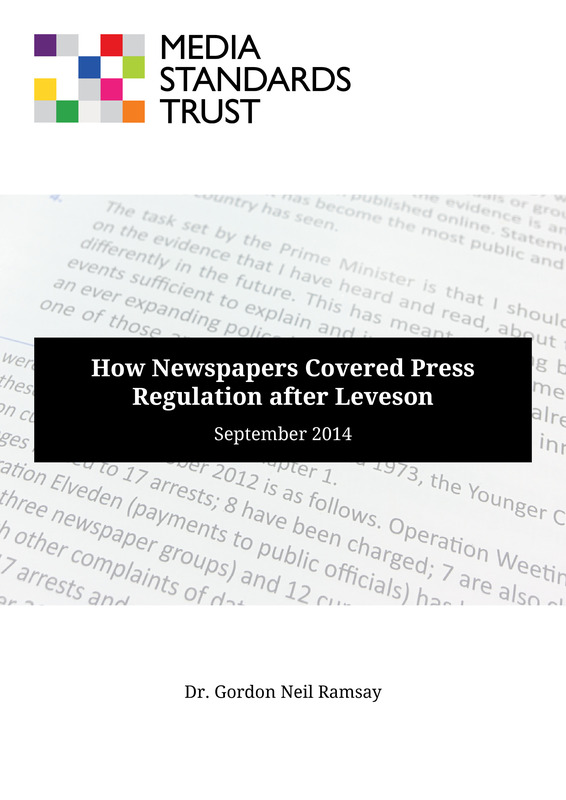 The Media Standards Trust today publishes the first comprehensive analysis of UK national newspaper coverage of press regulation following the publication of the Leveson Report in November 2012. Public opinion about press regulation – as reflected in 24 opinion polls conducted during and after Leveson – was not represented by the national press. The analysis included all 2,047 articles published in print and online by 19 national newspapers about press regulation in the 12 month period from November 29th 2012 (the day of publication of the Leveson Report) to 29th November 2013 (a month after the sealing of the Royal Charter). Extensive coverage: coverage of press regulation over this period was extensive, and opinionated. Seven in ten articles contained one or more opinions about Leveson or the Royal Charter in the 12 months after the publication of the Leveson Report. The majority of these opinions were negative – around 60% of articles in which views were expressed contained only negative views. Highly polarised: only a minority of coverage – both commentary and factual – sought to be balanced. Where opinions were included, articles tended to be polarised, containing only positive, or only negative, views. Public opinion absent: almost no reference was made to public opinion in these articles, even though 24 opinion polls were commissioned on this topic during and after Leveson. Only 1.6% of articles referred to public opinion data. Coverage not representative: the views of the public were not reflected in the editorial line taken by most newspapers. The polls showed that the public consistently supported a Leveson-type solution and did not trust the alternatives proposed by newspapers. Yet most coverage of Leveson was negative and most coverage of the industry alternatives positive. Exceptionally negative about Leveson and the Royal Charter: leader and comment articles were overwhelmingly negative. 80% of leader articles with a view on press regulation contained only criticism of Leveson or the Royal Charter. Wholly positive about industry alternatives: the national newspapers who signed up to the industry’s alternative regulator – IPSO – published only supportive leaders about IPSO (8 in total) and the Pressbof Royal Charter (19 overall). Failure to back up criticism with evidence: 862 articles contained a claim that Leveson or the Royal Charter posed a threat to press freedom, yet only 30% backed up the claim with evidence, and only 15% provided an opposing view. “People may not be surprised to learn that that the national press were strongly critical of Leveson and the Royal Charter, but are likely to be struck by the sheer volume of negative coverage – in commentary and news reports. Most newspaper readers would not have seen a single article that was wholly positive. Indeed many will hardly have seen a balanced article. 70% of leader columns in the national press in the year after Leveson reported were entirely negative. Far from representing the views of the public, or even their own readers, the national press appear to have ignored their own readers views in favour of an overwhelmingly one-sided editorial line – an editorial line that was consistent with their own interests. To ensure transparency, the full dataset is made available here, with access to a series of FAQs on the methods and aims of the project here, and a log of changes to the dataset here. Coverage of press regulation in the UK national press was extensive. In the year following the publication of the Leveson Report, 2,047 articles were published across the national daily and Sunday press, an average of 5.6 articles per day as compared to 4.0 per day in the 18 months from July 2011 until publication of the Leveson report in November 2012. There were particularly high levels of coverage in three periods: in the aftermath of the publication of the Leveson Report; around the agreement on the Cross-Party Royal Charter in March 2013; and in October 2013, when the Royal Charter was sealed following the Privy Council’s rejection of the newspaper industry’s own draft Royal Charter. The majority of coverage contained some evaluation of Leveson or the Charter. Over two-thirds of articles (1,421 of 2,047, or 69.4%) contained one or more evaluative statements on the Leveson Report and/or the Cross-Party Royal Charter. This was over three times as much as during the 18 months prior to publication of the Leveson Report (436 of 2,016, or 21.6%). A majority of the 1,421 articles – news and opinion – which contained an evaluative statement contained only negative viewpoints. 835 articles (58.8%) contained only negative or critical viewpoints. 217 (15.3%) contained only positive or supportive views, and 370 (26.0%) contained both supportive and critical viewpoints. Both the Leveson Report and the Cross-Party Royal Charter received a majority of negative coverage. 55.8% of articles containing a view on the Leveson Report were entirely critical (i.e. containing not one single positive reference), outnumbering positive articles by three to one. This rises to 64.5% of articles on the Cross-Party Charter, where the ratio is four to one. Leveson and the Cross-Party Charter were widely portrayed as a threat to press freedom. In total, 862 articles contained this assertion by a source or by the journalist – over 40% of all articles on any aspect of press regulation. As a proportion of the 1,421 articles containing a viewpoint on Leveson or the Cross-Party Charter, this figure rises to 60.7%. The majority of national newspapers contained a high proportion of negative-only coverage of Leveson and the Cross-Party Charter. Certain newspapers featured a significant majority of negative-only coverage: for every article in the Daily Mail that contained only positive viewpoints, there were more than 33 that contained only critical views. In the Sun, this ratio was 1 : 29. Of 18 newspapers that published articles with viewpoints on Leveson or the Charter, 14 contained more negative-only than positive-only articles; in nine titles the imbalance was by a ratio of over five to one. Only a minority of coverage – news and opinion – sought to be balanced. Articles, including news articles, tended to express one single view without reference to opposing views: in 15 of 18 newspapers containing articles where views were expressed, the proportion where both positive and negative viewpoints were included was below 30%; in seven titles it was below 20%. Coverage of Leveson and the Cross-Party Charter was mostly negative , as contrasted with coverage of the newspaper industry’s Royal Charter and the newspaper industry plans for a new regulator (IPSO) which was mostly positive. While on average only 15.3% of articles containing a view on Leveson or the Charter were wholly positive, 57.7% of articles with a view on the newspaper Industry’s Charter were positive, as were 65.4% of articles containing a view on IPSO. The results suggest that the majority of newspapers gave strong support to the newspaper industry’s own initiatives, and were highly critical of those initiatives that were not led by the newspaper industry. There was a structural difference in how sections of the national press covered Leveson and the Cross-Party Charter. After observing differences in coverage across groups of publishers, a separate analysis of those titles published by News UK, DMG Media, Telegraph Media Group, Trinity Mirror, and Northern & Shell found that those titles contained highly negative coverage (70.5% of articles containing a view were ‘negative-only’), a lower proportion of positive coverage (on average, around one positive article for every eight negative articles published), with the ‘threat to press freedom’ frame appearing in 74.5% of articles containing a view. Significantly, this group accounts for over 90% of weekly national newspaper circulation, and three-quarters of the national newspaper market. In contrast, those titles published by Guardian Media Group, Independent Print Ltd, and Pearson contained half as many negative articles proportionally (34.2% of articles), less than half as many instances of the ‘threat to press freedom’ frame (34.4% of articles), a roughly equal ratio of positive to negative articles (1 : 1.2), and were almost twice as likely to publish articles that contained both supportive and critical viewpoints. Leader articles and opinion articles were, by a very large margin, hostile to Leveson and the Cross-Party Charter. Out of 197 leader articles in which a view was expressed on Leveson or the Charter, 156 (79.2%) were negative-only and just 7 (3.6%) were positive-only. In addition, 272 of 369 opinion articles (73.7%) were negative-only, with 55 (14.9%) positive-only. 84.8% of leader or opinion articles by these titles contained the argument that Leveson or the Charter represented a threat to press freedom. A majority of factual news coverage (i.e. news reports and features) contained statements for or against Leveson or the Royal Charter. 806 News articles (66.7% of the total) and 49 Feature articles (43.8%) contained evaluative viewpoints on Leveson or the Charter. For News articles, this was a fourfold increase on the same measure of coverage in the 18 months prior to the Leveson Report (14.7%). Of these 806 News articles, almost half (46.8%) contained negative-only viewpoints. The argument that Leveson or the Cross-Party Charter posed a threat to press freedom was very frequently referenced in the national press. 862 articles published on the topic contained the argument – 42.1% of all articles mentioning any aspect of press regulation, and 60.7% of those in which a view of Leveson or the Cross-Party Charter was expressed. The claim that press freedom was being threatened was often presented with no supporting evidence, no counter-argument, and without a quote by an identified source. Less than 30% of articles in which the ‘Threat’ argument was made included specific evidence to justify the claim. Only 14.8% of these articles included the counter-argument that Leveson or the Charter did not threaten press freedom or political interference, and less than half based the ‘Threat’ claim on a quote from an identified source. The language used to describe Leveson and the Cross-Party Charter was emotive, repetitive, and focused on freedom and government interference. There were hundreds of references to ‘press freedom’ in newspaper coverage of press regulation, and to ‘shackles’, ‘muzzles’, and ‘curbs’ on the press. Certain phrases were repeated across news and opinion articles, and several newspapers, indicating a lack of plurality in the presentation of press regulation. Opinion came increasingly to be presented as fact, crossing the divide from ‘leader’ and ‘opinion’ articles, to factual news articles, and there was evidence of arguments being replicated word-for-word across comment pieces. Overall public opinion tended to be at odds with the negative line a majority of newspapers took on Leveson and the Cross-Party Charter. The majority of the public, in most polls (even excluding those commissioned by groups supportive of reform of press regulation) tended to be supportive of legal underpinning, supportive of the Leveson recommendations, and supportive of the Cross-Party Charter agreement reached in March, and of its specific provisions. This was in contrast to the strongly negative coverage of each of these issues in the national daily and Sunday press across the whole period of study. Individual newspapers did not reflect the viewpoints of their readership on matters of press regulation. Newspaper readerships displayed considerable consistency in terms of their support for the Leveson recommendations and Cross-Party Charter system. While there was some variation between titles (e.g. Sun readers being less supportive than other titles), each set of readers tended to be, by a ratio of at least two-to-one, in favour of their paper joining the Cross-Party Charter system. When surveyed on other aspects of regulatory reform, they supported legal underpinning, supported the Cross-Party Charter over the Industry Charter, and supported the Cross-Party Charter’s system of independent external review of a new regulatory system.